The world now eats richer meals than it used to. Since World War II, as people make more money from the U.S. to China, Brazil to India, our expectations for meals have risen. There is more meat on our plates. More dairy in our diets. And we eat bigger portions. Our personal choices of what we eat not only affect our personal health, but also, indirectly, the health of the environment. With so many options, the question of what everyone should be eating at the world’s dinner table can seem daunting. But considering our individual choices together, our demand for particular foods affects what is available to all of us. Although there will be at least 2 billion more people living on Earth by mid-century, population growth won’t be the main driver for increased food demand. The biggest driver will be the changing diets of the world’s growing middle class. In the past half-century, as countries have become richer, people have shifted from primarily plant-based diets to those that rely more on animal products. This “nutrition transition” has increased demand for animal products, and has transformed how we use our food crops. From now to 2050, it’s estimated that 40 percent of the world’s population—more than 3 billion people—will transition to a diet heavier in meat, eggs, and dairy. One obvious way to feed more people is to grow more food on our current croplands. Yet, while growing more on existing croplands will be part of the solution, intensification of croplands won’t be enough to meet our future needs. Instead, we need to find ways to shift our diets to feed more people while keeping us healthy. Globally, about 59 percent of calories that are produced end up as food for people to eat. But the story varies greatly depending on the country. We’re used to judging farmlands by how much they produce, with units like tonnes per hectare or bushels per acre. However, some of the countries that are most effective in producing crops are the least effective in using these crops to feed people. This map indicates the proportion of a given area devoted to food versus other uses (animal feed or fuel). 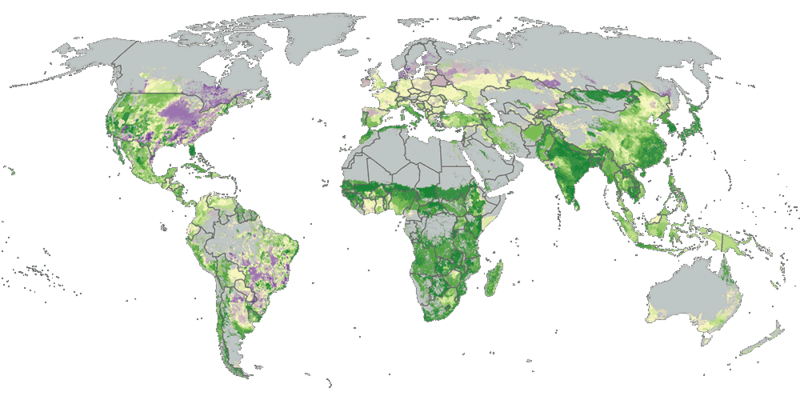 Map includes data on 41 major crops that account for 90 percent of calories produced on croplands. Right now, even ignoring the huge amount of food we waste, humans use only about 59 percent of the world’s calories as food—either directly from crops, or eating the animals that have eaten those crops. 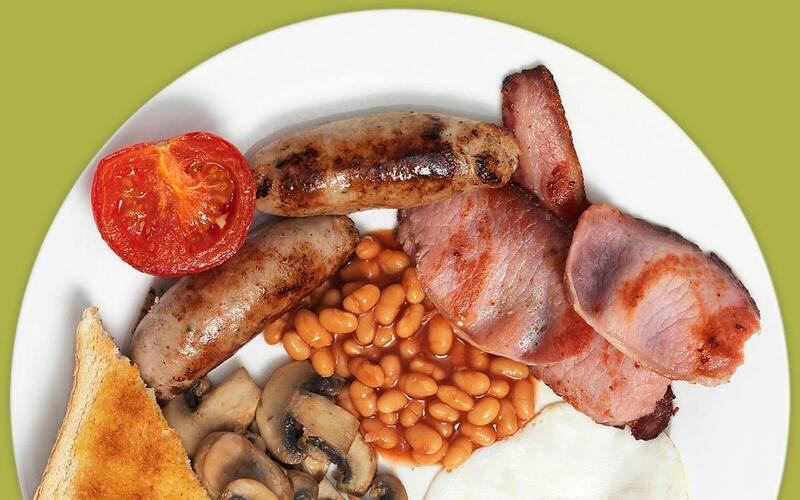 The rest of the world’s calories do not enter the human food supply at all. They go toward either animal feed—sustaining an animal over its lifetime but not transferred into edible calories for humans—or for industrial uses like bioenergy. While not considered in the scope of this feature, about 14 percent of global livestock feed (measured in carbon mass) is from pasture totally unsuitable for growing crops. This type of land use is very efficient for the world’s food supply, though it can still have significant impacts on biodiversity and carbon storage. Allocating more of the calories produced on the world’s croplands to food is critical, but not sufficient, to ensuring food security and health. It’s also important to address the nutritional content of diets, as well as poverty, the root cause of hunger and malnutrition. There are many other barriers to overcome between production and consumption. While we may produce enough food globally, often the food is not produced in areas that need it, and with the necessary infrastructure to distribute it. Nevertheless, the connection between how we allocate the crops we grow (measured in calories), and whether the food is available (measured by rates of hunger and malnutrition), does help us understand the environmental implications of how we choose to use our crops. In addition to animal feed, biofuels and other industrial products demand a smaller but growing portion of edible crops. In particular, the U.S. directs a lot of maize to ethanol production, while sugarcane is the biofuel crop of choice in Brazil. And biofuel production is growing fast: between 2000 and 2012, biofuels’ share of global crop production (by mass) increased sixfold. Croplands and pasture are, by far, the largest human use of land worldwide. But if you take a walk through farmlands in the United States, Brazil, or the European Union, it becomes clear that much of the crops currently being grown are not destined for people. 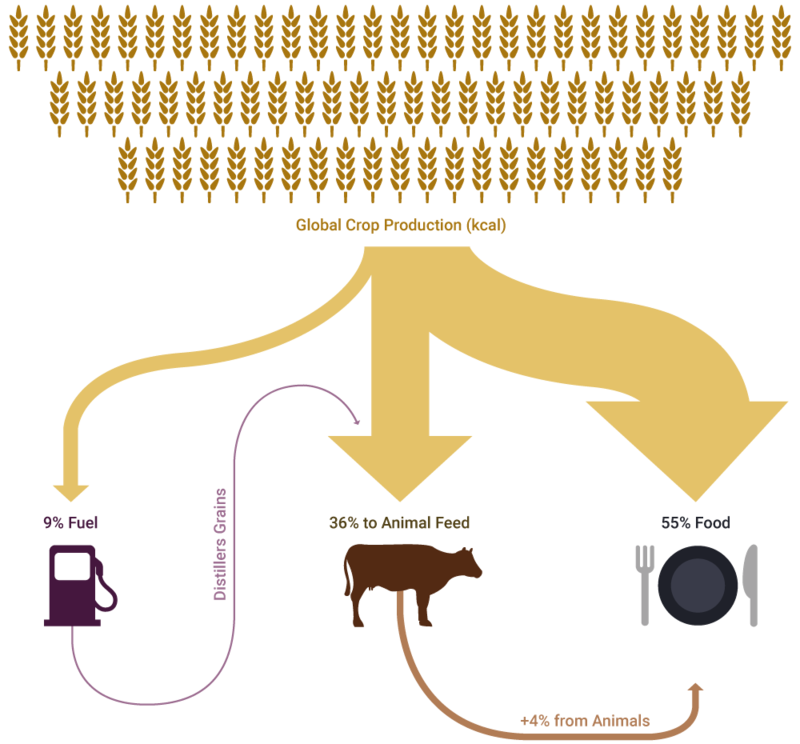 The more developed a country’s agricultural system, the more crops tend to be used to feed animals or make fuel. Worldwide, a substantial amount of crops grown are devoted to uses other than food, mostly for feeding animals or making biofuels. 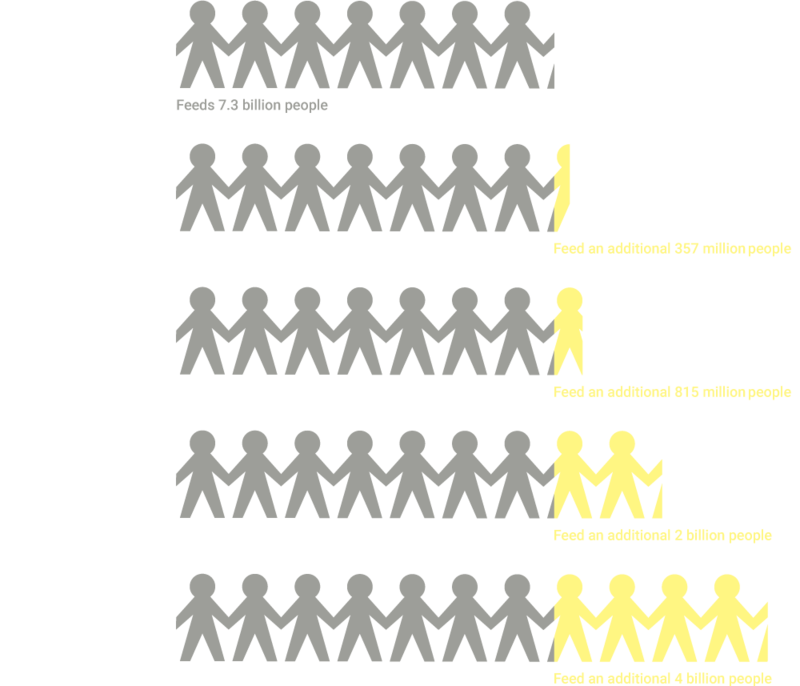 THE U.S. COULD FEED NEARLY THREE TIMES MORE PEOPLE THAN IT CURRENTLY DOES FROM THE CALORIES PRODUCED BY MAJOR CROPS. U.S. croplands produce a lot of calories, but an astounding two-thirds of calories are used to feed animals. If these calories were instead directed toward humans, the U.S. could feed nearly three times as many people as it currently does. India’s croplands are less productive, but 90 percent of the crops grown are used to feed people. For India, the bigger challenge is raising yields to their full potential. Brazil, like the U.S., devotes much of its crop calories to animal feed. If the calories used for feed and industrial uses were redirected for human consumption, Brazil could feed twice as many people. China: China accounts for a fifth of the world’s animal protein from meat, eggs, and dairy, and roughly half of the world’s pig meat. While China feeds more people overall than India, fewer of the calories produced are actually destined for people. So, with more efficient conversion methods, the country could feed a lot more people. Europe: European croplands (excluding the Russian Federation) devote more than twice as much crop calories to food than the U.S.
BY MIDCENTURY, MORE THAN 3 BILLION PEOPLE WILL TRANSITION TO A DIET HEAVIER IN MEAT, EGGS, AND DAIRY. When we feed animals crops, we lose a lot of the energy (calories) in those crops. The animal uses its feed to do what all animals, including us, must do: grow up, get around during the day, and support the biological systems that humans don’t eat, such as the skeleton, brain, and nervous system. Compared to eating plant-based foods, getting calories from animals is much less efficient. Of course, calories aren’t everything. Meat and dairy are excellent sources of vitamins and minerals in our diets, and in some areas of the world provide a critical source of nutrition. Nevertheless, this conversion rate is at the heart of why diets will drive how much crops we’ll need to produce in the future. As we eat diets heavier in meat and dairy, we indirectly demand much more land for feed crops. The good news is that simply shifting from one kind of meat to another can dramatically reduce the impact of our diet on the environment. On one end of the spectrum, cattle convert just 3 percent of the calories they consume in feed to edible beef. On the other end, 40 percent of calories that dairy cows consume are delivered to us in the milk we drink. Meat, dairy, and eggs are central to the world’s food system—present and future—precisely due to their high need for land. The data used in this visual encompass crops that contribute more than 90 percent of the world’s total produced crop output. These estimates do not account for food loss and food waste, which claim an estimated 25 percent of global calories. Crops allocated to biofuels were based on data from biofuel-producing nations in 2000. Compared to animal-based foods, plant-based foods have lower greenhouse gas emissions. Animals need more feed crops, which means more emissions from fertilizer (nitrous oxide) and transportation (carbon dioxide). If forests or savannas are cleared for agriculture, carbon dioxide is emitted as these trees and grasses are lost. Over their lifetime, ruminants like cows and goats also emit gas themselves (methane from the animals’ burps and farts). By midcentury, annual greenhouse gas emissions from food production and clearing of new land for agriculture will be 80 percent higher than in 2009. The kinds of meat and dairy we choose to eat, and how much, greatly affect the GHG emissions from our diet. Dietary changes don’t have to be extreme to considerably reduce the impact on the environment. Meat that requires a lot of energy to produce, like beef, can have up to 250 times the emissions of a plant-based protein like legumes. Emissions from producing eggs, dairy, poultry, and pork, however, are much lower than emissions from beef or lamb. The way that plant-based foods are grown also greatly affects their greenhouse gas emissions. For example, because rice is usually grown in submerged paddies, a lot of methane is produced from fermentation of the organic matter in the wetlands. Therefore, emissions from rice can be five times greater than growing the equivalent calories of wheat. Even with small shifts in our diet, we can still retain important sources of nutrition from animal-based foods. Eating smaller portions of meat and fish can result in lower GHG emissions, while also supplying protein, essential fatty acids, minerals, and vitamins. Different foods have different impacts. For example, poultry and fish have much higher GHG emissions than fruits and vegetables. Diets comprised of more fresh fruits and whole grains, then, will result in less emissions. THE TREND TOWARD RICHER DIETS AROUND THE WORLD WILL COME AT A DRAMATIC COST TO HUMAN WELLBEING. A change toward richer diets around the world comes at a cost to human wellbeing, in the form of increased incidence of chronic diseases that compromise our health. Shifting away from animal products would not only increase the amount of food available for humans, but would likely also make us healthier and lengthen our lives. The transition to diets high in meat, refined sugars, refined oils, and fats have not only demanded more of our food supply, but increased the global incidence of Type 2 diabetes, coronary heart disease, and other chronic, non-communicable diseases. Small shifts in our diets can have a big impact on how many people can be fed. These estimates show how many more people could theoretically be fed with relatively small global shifts in diets. The last estimate (“switch to an all-plant diet”) serves to illustrate the maximum possible people fed. It assumes that humans eat everything we grow instead of feeding crops to animals, that we stop using food crops for biofuels, and that we completely eliminate avoidable food loss and food waste. Credits: Emily Cassidy, Michael Clark, Barrett Colombo, Peder Engstrom, Alex Reich, Andrew Urevig, Paul West. Design: smashLAB. Bajželj, Bojana, Keith S. Richards, Julian M. Allwood, Pete Smith, John S. Dennis, Elizabeth Curmi, and Christopher A. Gilligan. “Importance of Food-Demand Management for Climate Mitigation.” Nature Climate Change 4, no. 10 (October 2014): 924–29. doi:10.1038/nclimate2353. Bonhommeau, Sylvain, Laurent Dubroca, Olivier Le Pape, Julien Barde, David M. Kaplan, Emmanuel Chassot, and Anne-Elise Nieblas. “Eating up the World’s Food Web and the Human Trophic Level.” Proceedings of the National Academy of Sciences 110, no. 51 (2013): 20617–20. Cassidy, Emily S., Paul C. West, James S. Gerber, and Jonathan A. Foley. “Redefining Agricultural Yields: From Tonnes to People Nourished per Hectare.” Environmental Research Letters 8, no. 3 (2013): 034015. Drewnowski, Adam, and Barry M. Popkin. “The Nutrition Transition: New Trends in the Global Diet.” Nutrition Reviews 55, no. 2 (1997): 31–43. Foley, Jonathan A., Navin Ramankutty, Kate A. Brauman, Emily S. Cassidy, James S. Gerber, Matt Johnston, Nathaniel D. Mueller, et al. “Solutions for a Cultivated Planet.” Nature 478, no. 7369 (2011): 337–42. Heller, Martin C., and Gregory A. Keoleian. “Greenhouse Gas Emission Estimates of US Dietary Choices and Food Loss.” Journal of Industrial Ecology, 2014. “International Energy Statistics: Biofuels Production.” 2015. U.S. Energy Information Agency. Accessed June 17, 2015. Keats, Shandra, Steve Wiggins, and others. “Future Diets: Implications for Agriculture and Food Prices.” Update, 2014. Popkin, Barry M. “The Nutrition Transition in Low-Income Countries: An Emerging Crisis.” Nutrition Reviews 52, no. 9 (1994): 285–98. Tilman, David, Christian Balzer, Jason Hill, and Belinda L. Befort. “Global Food Demand and the Sustainable Intensification of Agriculture.” Proceedings of the National Academy of Sciences 108, no. 50 (2011): 20260–64. Tilman, David, and Michael Clark. “Global Diets Link Environmental Sustainability and Human Health.” Nature 515, no. 7528 (2014): 518–22.